Airships. The very word conjures images of sleek silhouettes slicing through the skies and portends of audacious adventure. It is the height of the Victorian Era and England has organized a rousing gala of pomp and fanfare to showcase its latest lighter-than-aircraft design. Are you daring enough to brave the winds, elements, and competing aeronauts for glory and honor? But more importantly, are you gentlemanly enough? Aye, for the Queen, herself, will grace this event with her attendance! Quicksilver is a racing game with a mixture of programmed movement and card play, plus a high dose of direct interaction. As airship pilots, players jaunt around a customized course, dodging all manner of obstacles and attacks, in a frantic dash for the finish line. Of course, thwarting an opponent’s progress with a well-time cannon shot or fortuitous ram can prove just as advantageous! So the top of the box is rather nondescript. Here’s the bottom. 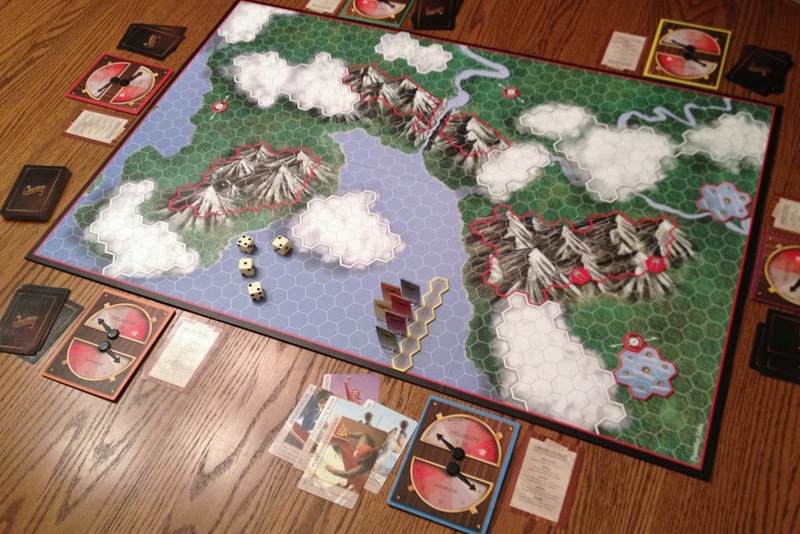 Choosing from two, hex-based courses on the double-sided game board, players first set-up the racing grounds by plotting the start/finish line, check points, and obstacles such as clouds, mine fields, and strategically emplaced gun turrets. Both tracks already include permanent cloud banks. Plus you’ll want to mind the stationary mountains and buildings – smacking into the side of either will slow you down…to put it mildly. 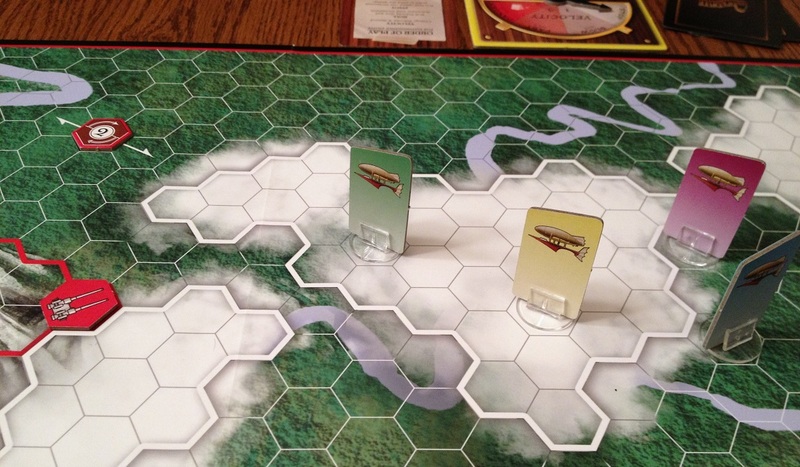 Players begin with one Quicksilver airship at the starting line and a hand of five cards. Cards have an ability and a point value. Turn structure is straight-forward in this chase. In strict order, you will set your ship’s velocity, roll a die (or dice) to determine movement points, pivot your craft (if you wish), and then move the remaining movement points that exact number of hexes. You end your turn by drawing a card. Start of a full, six ship race at Paradise Falls. Velocity is marked by a needle indicator from 0-3 on a handy instrument panel. At the beginning of your turn, you may reduce or increase your speed by one. Roll one die for each velocity level to determine the number of spaces you move. There is an increasing minimum that you’re guaranteed at each speed, otherwise you’ll move the number rolled. Be careful at maximum velocity, though. It’s considered so dangerous that you must discard two cards as a result. Once they getting going, airships can only fly straight forward. However, before you get underway, you may spend one of your movement points and pivot 60 degrees, or one hex face. You can spend another point to pivot an additional 60 degrees, but the strain on your fragile vessel decreases your armor by one. Armor is the Quicksilver’s structural rating which is also tracked on your instrument panel. Suffering too much stress and/or damage will quickly put the air-brakes on your little pursuit. Your instrument panel tracks important stuff like speed and whether or not you’re about to be blown out of the sky! After pivoting, you must use all of your remaining movement points – navigating straight ahead, whether that takes you into the side of a mountain, through the sites of a gun emplacement, or right off the edge of the map – none of which are highly recommended. There is one caveat to the movement roll in that beginning a turn within a cloud bank reduces your allowance by half. While all of this sounds, and can be, quite random, cards give you an opportunity to mitigate that somewhat. You may play one card from your hand, using its point value (from 1-3) to either decrease or increase your movement points for the turn. There is also one card whose power is an “all stop,” which you may apply at any point during flight. Should you fly through a hex which an opponent already occupies the two ships collide, unless the activeplayer pulls off an incredible evasion maneuver – otherwise known as discarding a card. If he chooses not to, then both players roll a die. 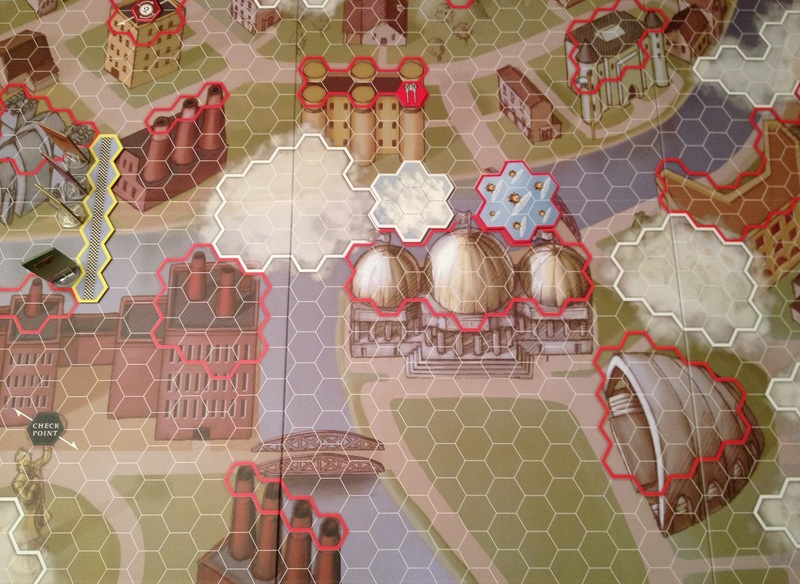 The one with the lower result loses a point of armor and then the active player continues along his flight path. However, you may play one or more cards from your hand to modify your result by their point values so that you’re not completely at the mercy of the cubes. However, the majority of cards will be used for their ability or event. You can use cards at various times, as described by their text. One lets you force a re-roll of any die result, whether your own or an opponent’s and whether in movement or during an attack, and whether on your turn or not. One card repairs a point of armor damage. Another gives you more control on movement. Yet another forces an adversary to discard cards. And so on. A few types of cards let you attack another airship. Now, you may only conduct assaults either before your ship moves or after you’ve exhausted all of your movement points. The specific card indicates what range your intended target must be within, as well as what type of damage is afflicted upon the defender should the attack succeed. Resolving a fight is handled in the same manner as collisions, except that the attacker does not suffer any penalties if he loses. Finally, you end by drawing a card, but it cannot be played until your next turn. The first aeronaut to successfully navigate all the check points and limp across the finish in tact will be showered with accolades, parades, riches, medals, champaign, and adoring young ladies. Just remember – you’re still a gentleman. Ranged attack cards for you rascally pirate types! Friendly Skies? Or Full of Hot Air? Have you ever seen Those Magnificent Men in Their Flying Machines? 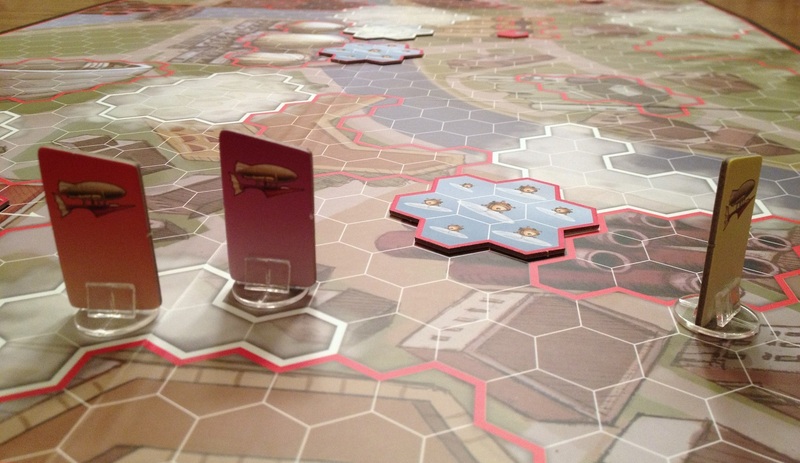 That classic period comedy runs through my head almost the entire session when playing Quicksilver. If you haven’t, go and watch it – as soon as you’re done reading this review! It’s great stuff. Sure that story deals with heavier-than-aircraft, rather than zeppelins, and is set in Edwardian times, as opposed to Victorian. But it has a frantic air race with fragile machines, zany antics, and dastardly subterfuge. With every collision or attack I immediately imagine the wily Frenchman and stuffy Colonel von Holstein dueling with balloons and blunderbusses. And each sabotage hints of the great Terry-Thomas with his vaudeville-esque tricks lurking about in search of mischief – and that scheming competitive edge gained at any cost! 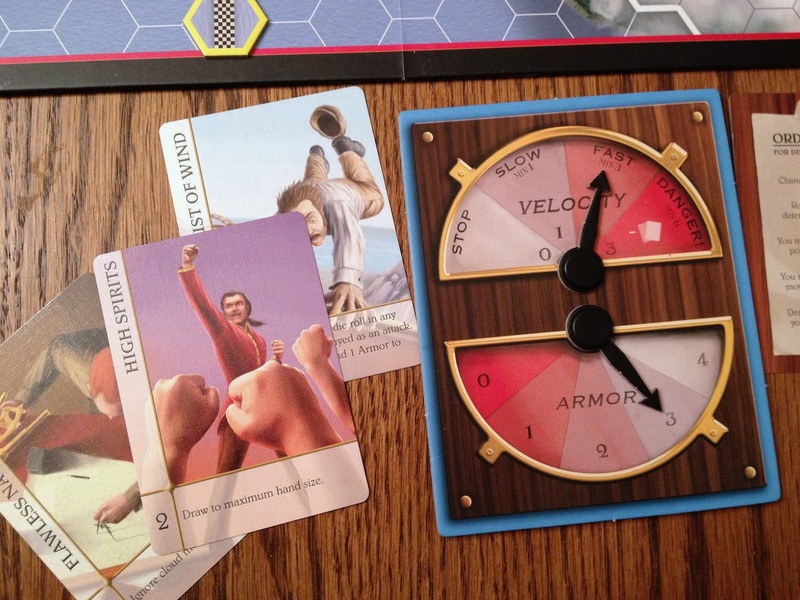 The card play mechanic injects an equal measure of uncertainty, strategy, and chaos which elevates Quicksilver from a mundane racing game to a fun-themed “gentlemanly” brawl. 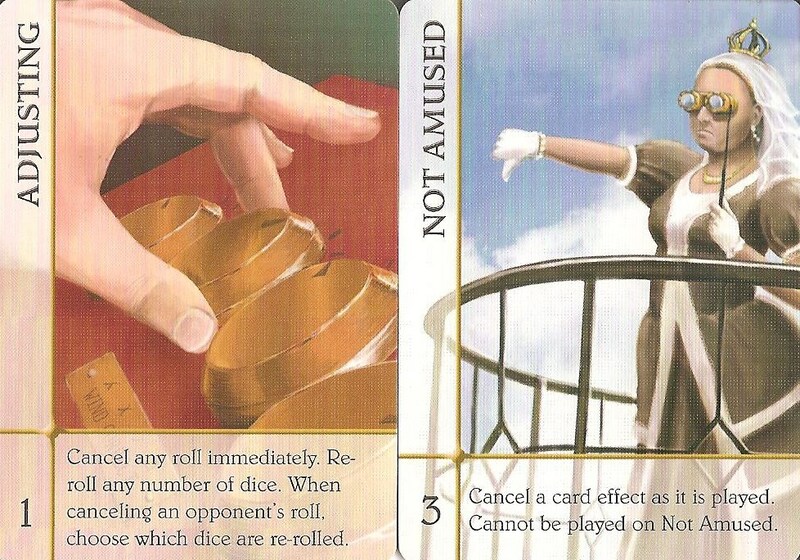 Sure, the die rolls for navigation and combat, as well as the card draw, add a healthy measure of randomness. 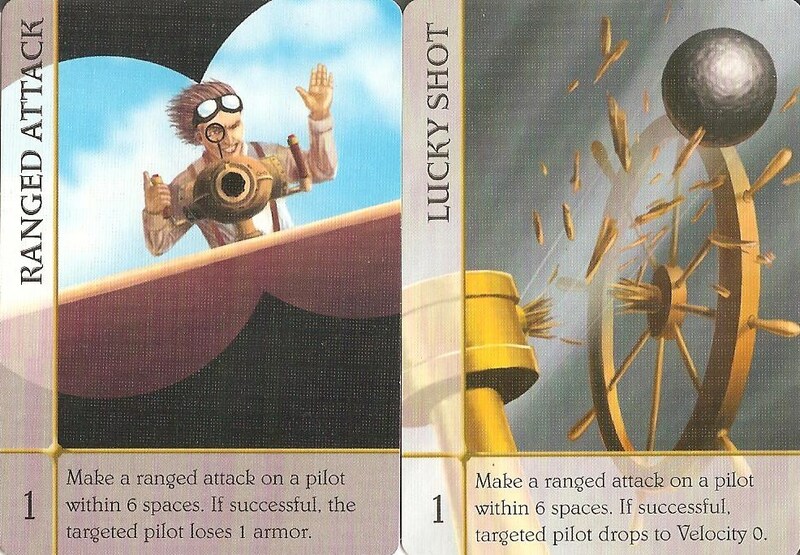 But the three options for card usage help mitigate that luck to a greater degree than one might expect. It gives players freedom to experiment with different navigational methods and tactical maneuvering. Leave it to Her Majesty to bring some civilized decorum to the affair. It’s good to the Queen! The movement restrictions require planning before hitting the throttle. Navigation is one-third programmed, one-third random, and one-third controlled. Velocity determines the number of dice you roll, so the faster your velocity, the farther you can potentially fly. The result of that throw is purely random…and just as binding. You can spend one point – or two with a penalty to armor – in order to pivot directions. After that, though, all remaining points are applied to a straight path. If that’s going to slam you into the side of a mountain or send you careening off course, you better reconsider your speed! Thankfully, you do have a modicum of control by playing a card. Granted, you can only use one card in this fashion; and it often comes down to needing an optimal value in hand. But it is a measure of management, nonetheless. The real tension and satisfying reward is in efficiently coordinating all three aspects – set speed, dice, and cards – to turn a tight corner, or perfectly round a checkpoint, or fly through a narrow canyon, or open up the throttle on a clear straight-away. Now, I’m not implying that Quicksilver is a strategic, calculating affair. There are too many unknown parameters to create sophisticated play. Its value lies elsewhere. First off, the theme is fun and somewhat unique, with a quasi-Steampunk taste. There are a few historically alternative elements in the game. The Quicksilver ship, itself, is obviously of a different configuration and type than real dirigibles of the time. You have blimp-to-blimp combat and hovering minefields. However, the Steampunk vibe isn’t terribly garish – so it shouldn’t turn off gamers averse to the genre. The artwork and flavor text are splendidly Victorian. Navigating through buildings and around a minefield. Kind of like London cab drivers. The manner, though not necessarily the amount, of interaction will ground this game for serious, strategic consideration. Because resolution involves a good deal of chance, collisions can often backfire and attacks may be squandered, much to the consternation of calculating gamers. However, if you’re prepared with a good hand to modify your luck, you can stack the odds and create uncertainty in your opponent. Of course, the reverse is true if your target is well-stocked with cards, himself. That aspect adds tons of entertainment, lots of laughs, and plenty cries of derision. All of this conflict is an appropriate level, too. Attacks start out as merely a nuisance. They’re not really crippling until you suffer several over time so that your armor drops to zero. The double-sided board and customizable set-up are two of Quicksilver’s stronger attractions, believe it or not. One, it greatly enhances the game’s replay value. More significantly, the variable track configurations let you tailor a session to the particular tastes and sensibilities of individual gamers and/or gaming groups. Want a challenging, mad-capped demolition derby? Well, set out all check points and load up on obstacles. You could even set the check points so that racers need to double back and forth across the grounds in an epic, grueling slugfest. Or maybe you prefer a bit swifter affair? In that case, set out one marker for a quick jaunt out and back again. Besides the course itself, the rules book includes several variants to enhance interaction or further mitigate randomness. The permutations are legion! 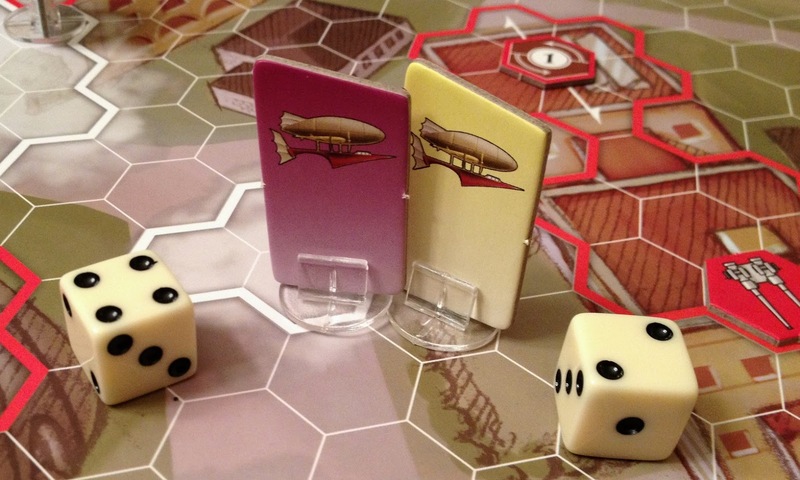 Quicksilver shines with more players as they maneuver and fight for advantage in the crowded skies. With only two or three aeronauts, space opens up which reduces the instances, and severity, of interaction. Admittedly the full complement of six pilots really ratchets up the chaos and the game tends to go long, as a result. If your group can handle that, then great. Otherwise, it will probably appeal best with four or five players. The components are durable, if somewhat standard. 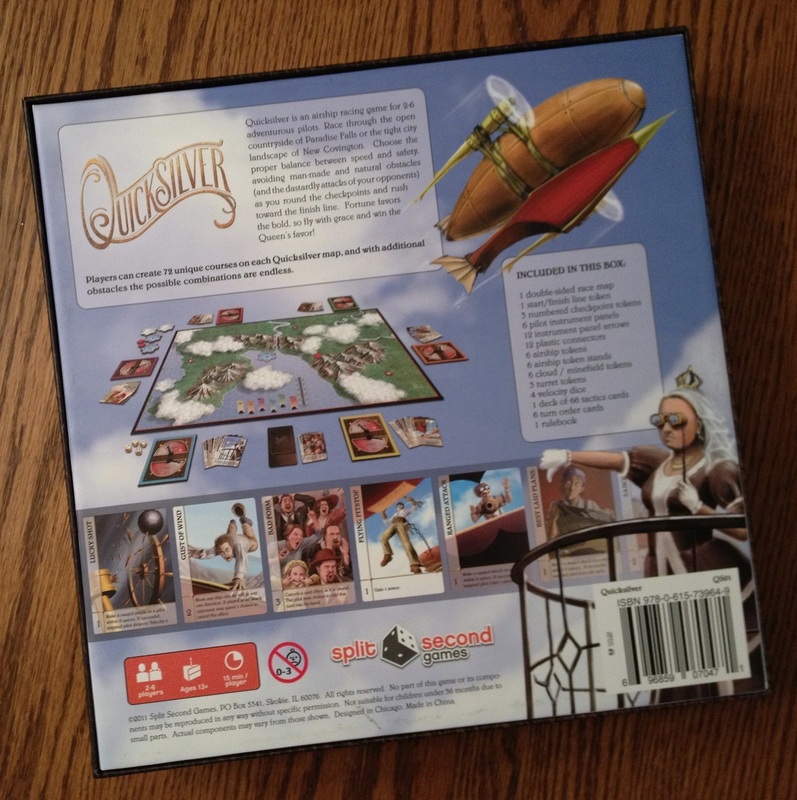 It’s a shame the game didn’t include actual airship miniatures, instead of the cardboard standees. On the plus side, the personal instrument panels are well-designed, functional, and thematically appropriate. They do take some simple assembly and you have to be careful punching the arrow indicators from the punch board. But it looks really nice when finished. 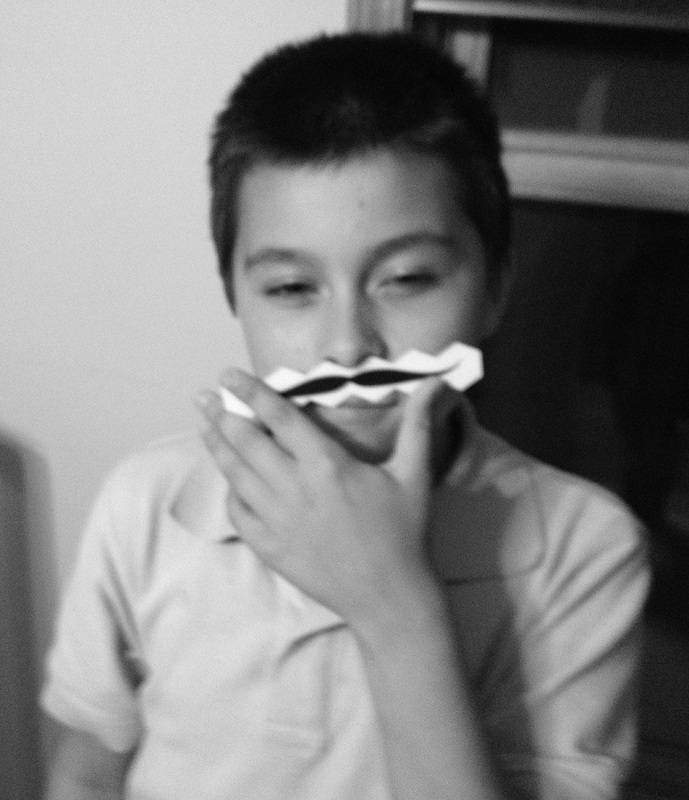 And in one of the most brilliant, superfluous production inclusions I’ve ever seen or heard of, the game includes a cardboard mustache – for no other reason than that a proper gentlemen should have one, of course! Quicksilver certainly won’t be for every gamer…but it comes close. With customizable courses and good rules variants, it has the ability to meet a variety of situations and appease just as many gamer personalities. If there’s an aspect that may not be to your tastes, just tweak it to your liking per the rules suggestions. Those really opposed to direct interaction will be one of the few passengers that shouldn’t board this ship. Otherwise the theme, action, speed, and opportunity for smart play keep Quicksilver cruising along at high altitude. 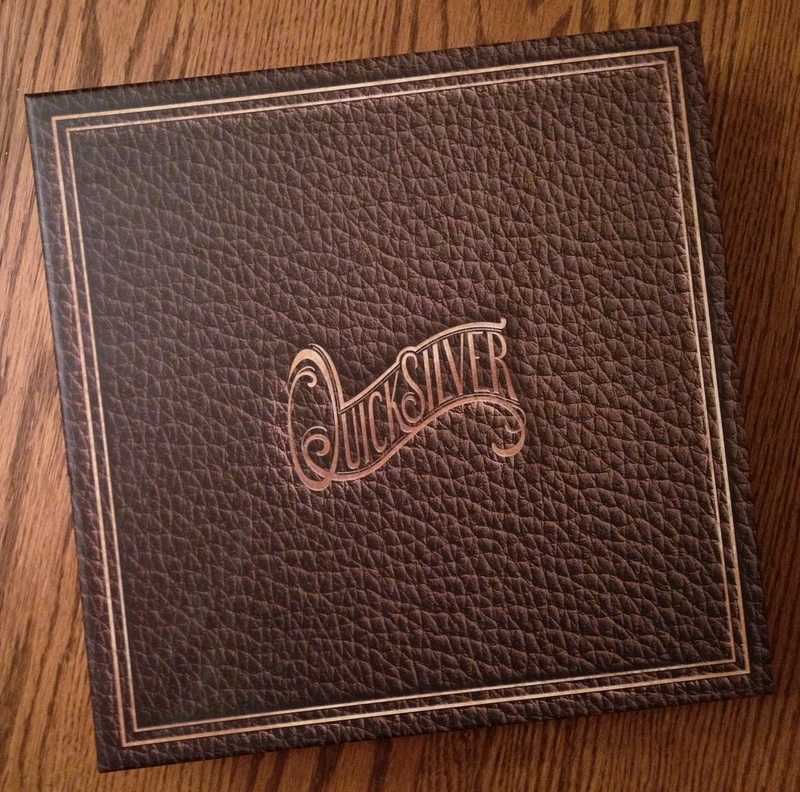 iSlaytheDragon would like to thank Split Second Games for providing a review copy of Quicksilver. Enjoy this review? Stay up to date on our latest news, reviews, and guides by following us on Facebook, Twitter, and/or Google+.